This is my primary system, used to run the reincarnation of the Wofford Witch. My PDP-11/40 system is housed in 3 H960 cabinets in my Wofford Witch computer center. The center cabinet contains the 11/40 CPU, core memory, RK11D, and all other boards that are mounted in the backplanes in the BA11-F system box. The BA11-F is the 21 inch chassis model and takes up two panels in the rack. 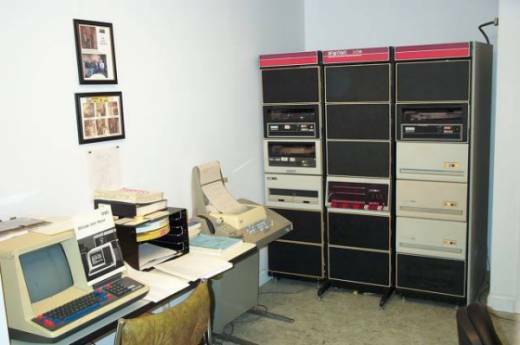 The cabinet on the left contains two RK05 drives and an RX01 dual floppy unit. The cabinet on the right contains an RK05 drive, an RL01 drive, and two RL02 drives. Mounted in the top rear of the right cabinet are the DZ11 EIA and 20mA distribution panels to allow up to 16 terminals to be connected to the system. 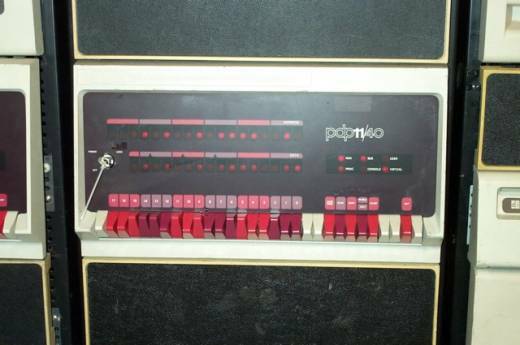 The PDP-11/40 system was introduced by DEC in 1972.